"And then the lady smiled and disappeared." I say as I watch the children around staring at me in awe. "Grandma, how do you know these stories?" The youngest of them asks. "I make them up, in my head." I say with a smile. "You should write a book, Grandma. Then I can read it on my Kindle." Another little girl chirps. "I have a lot of stories in my mind, yes. But they are not worthy of your gadgets. You children have access to almost everything these days. My stories are nothing but a way to pass time." I say adjusting my glasses. "No Grandma, you should write them. I shall bring my Ipad for you tomorrow. You should write." The little girl continues. I look at her with admiration. Such a young girl and yet aware of everything around her. It was not like this during my time. Back then, we used to wait for our grand parents to get free so that they could tell us a story. But they hardly found time to do so, because they were busy making a living. Every story told was a treasure and we would never get bored of it, no matter how many times we heard it. But these days, the kids are so glued to their Ipads and laptops that they do not need anyone else. Apparently even story books are now read on a Kindle, so there goes that as well. "So, what do you say?" She walks up to me. "My darling, I'm 72 years old. I have no idea how to use all your fancy gadgets." I say shyly. "But you can learn, we shall teach you. You know to read and write anyway." She urges. "At this age, my eyes would hurt looking at the bright screen. I have the stories in my mind don't worry. You shall all get to hear it until I'm around." I say emotionally. "And what happens after that?" Another child asks. I just smile and bid goodbye to everyone. Later that night, my grand son walks into my room, his hands behind his back. "Your stories will always live Grandma. Here, this is for you. And this will not hurt your eyes either." He places the package in my hand and runs away. I sit at my wooden table that night, writing slowly in the book that he gave me. 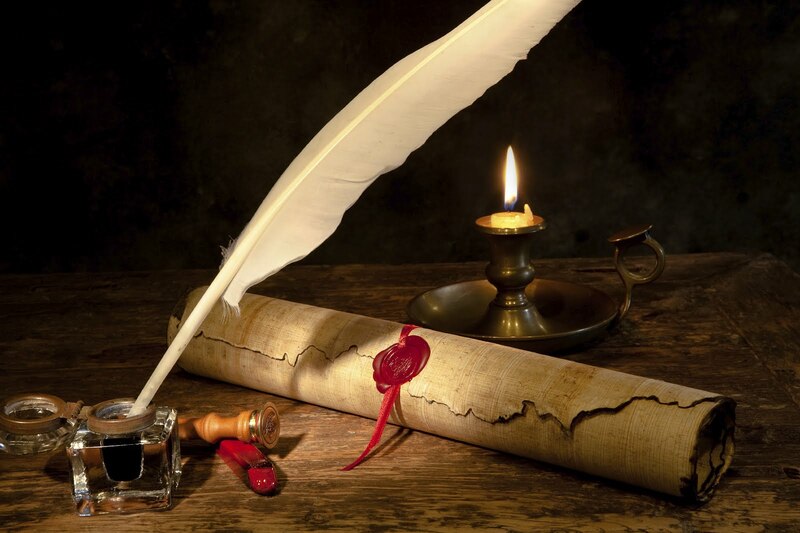 Before I know it, the quill takes over me and I'm soon writing story after story. It is not for the kids, it is for me. I want to let my words speak for once instead of me. Years later, as my grand son hands this book to his son I look down from above and smile. The stories live on and the quill is still etched in my heart. Linking to the A to Z Challenge. I feel like I had a cup of hot tea on a rainy afternoon :) This one warmed my heart. Such a magical tale! Took me back to my childhood days. Thank you! That's indeed a powerful one.. enjoyed reading it..
That's good to know that you're happy now.. Awesome! One filled with the love for writing, love for grandma and love for tales being told. Beautiful..It's like living long after being gone. Lovely story. I wish more people recorded their stories one way or another. Such a beautiful post, Soumya. Touched my heart. Writers indeed can live forever through their words. I think that would be all of us...writers of little stories...and as our grandkids read our stories we will watch over them and smile!! :) Hmm...I like that idea!! People and real life over technology, anyday :) Any damn day. Yes, the stories live on. Sometimes, I feel the same for our blogs too. I mean they would be there after we are gone, right? That somebody would be able to read them, may be know a little more about us after we are no longer there - and that's a beautiful thought, isn't it? aww how beautiful the stories are being passed on. I still love paperbooks. Kindle is not my thing. That's beautiful. It kinda makes me wish that my grandfather had written down all the stories he told me. Maybe you can write them down now, if you remember.